Founder of the Papua Jungle Chef Community and ambassador for traditional Papuan gastronomy. Fate had a part to play when Charles Toto’s life path changed from becoming a lawyer to entering the food world. In 2006, Chef Charles established the Papua Jungle Chef Community, a network of enthusiasts from across the Indonesian region of Papua who promote sustainable living and environmental protection through local cuisine. Chef Charles was inspired to form the Jungle Chef Community after seeing foreign documentary makers and tour groups embarking on long treks in the Papuan wilderness with nothing more than instant and canned food. Over the years, he has learned to make the best use of the ingredients served up by the forest and the sea. Chef Charles, who works for Benneti Expedition Tour and Travel, has already taken his unique mission to culinary shows across Indonesia and abroad, and has big dreams of presenting the traditional gastronomy of Papua to more international audiences. 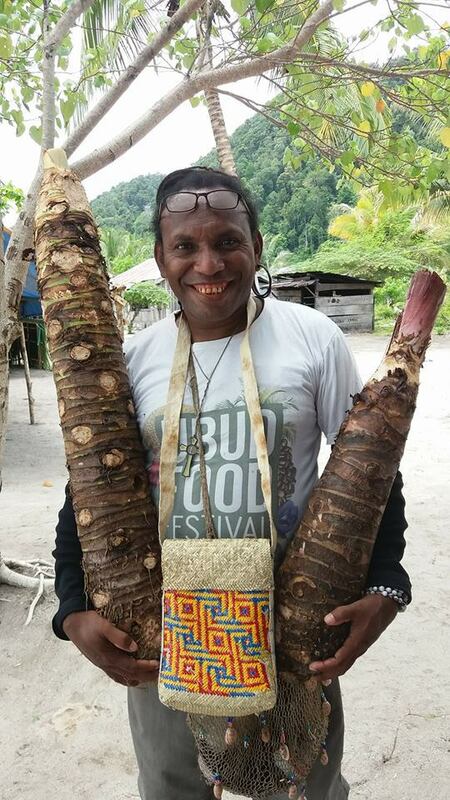 His mission is to create awareness about his homeland, while maintaining the resilience and sovereignty of local food so the next generation of Papuans can enjoy age-old traditions. How did you become involved in the food world? I was born and grow up in a village name Ormu Kecil (Little Ormu), in Jayapura, Indonesia. I come from a big Toto family – that is where I got my last name from. At 16, I enrolled in a culinary program at a vocational school in Jayapura, the Papua provincial capital. Becoming a lawyer was my biggest ambition at that time; I had my heart set on it. However, after missing out on a place in a regular high school, which would have put me on a path to a career in law, I figured I would sign up for vocational school. After the three-year course, I wound up in an entry-level job washing dishes at the hotel in Jayapura, and upon meeting lots of tourists at the hotel, thought about trying to cater to these tour groups by providing them with fresh, wholesome meals during their trips. The idea went over well, and I catered for my first tour group in 1997 - a year after leaving vocational school. That inaugural trip lasted some six weeks, with the group trekking through the densely forested Baliem Valley in the Papuan highlands, then heading west to the now-famed coastal paradise of Raja Ampat. The excitement of being a cook has conquered any regrets I had about not becoming a lawyer. Who do you look for inspiration when it comes to cooking? When I was a child I would watch my mother create delicious recipes from our local food sagoo – looking back she was an inspiration for me. I also see the women from my village as my source of inspiration – they whole-heartedly keep traditional recipes from our ancestors from generation to generation. When I first looked into catering for tour groups, I began to talk to locals about meals I could make from using resources found nearby. What was the catalyst to establish the Papua Jungle Chef Community? Papua Jungle Chef Community was founded in 2006 to reinvent local wisdom around cuisine and traditional recipes. It provides over 120 local residents with hospitality training to cook for tourists from the mountains to the beach. We have aimed to raise the incomes for those who live around the tourist attractions in our region, while also providing job opportunities for the young people who live inland and along the beaches, and those who have never attended formal education (drop-out and non-school). There are 23 chefs in total who belong to the Community – 15 chefs are being equipped with all the necessary skills they need to serve guests on tours. There are six chefs in the city and another seven chefs scattered inland and at the beaches. Our objectives are to bring prosperity to the local people, to do more research on some endemic plants of Papua that have slowly begin to extinct. Papua Jungle Chef Community is an independent organisation, and we have not had a lot of sponsorship previously. To achieve our desired outcomes, we need to keep upskilling our members during tours, or I train them myself when I can. What are some of your favourite dishes to make using local ingredients? My favourite is Sagu Bakar Kupas (grilled and peeled sagoo) from the southern part of Papua (Korowai/ Kombai tribe). Why should Papuan chefs use local products in their work? By using local products in our cooking, we know what we are getting – that it is organic and free of chemicals and pesticides. By doing so, people can live much longer and healthier. My grandfather ate roasted tubers and boiled vegetables for most of his life and he lived until he was 105-years old. What would you like to accomplish as a Community in the future? In the near future, we aim to present our traditional gastronomy of Papua to international audiences, and create awareness about the island of New Guinea around the world. Furthermore, our purpose is to keep and maintain the resilience and sovereignty of local food, for Papua’s future generations.